Cloudburst Productions is owned and operated by Russell Lyman who lives in the S.E. Alaska town of Haines, where he draws inspiration from the majestic Saint Elias and Coast Range Mountains which surround him. The artwork for Russ' maps is done by hand, providing a unique old-time look. Great effort is taken to draw the maps to scale so they not only look good but are accurate as well. The Alsek map was drawn DIRECTLY from the topographic maps. Due to my love of the natural world and concern for the future of our environment, I use Tree-free paper whenever possible. Depending on what is available when a product goes to press, it may consist of blends of tree-free fibers such as hemp, sugarcane, or 100% post-consumer recycled (no virgin tree fiber). 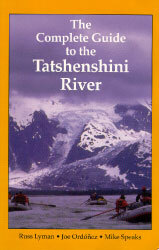 The Complete Guide to the Tatshenshini River, although not on 'tree-free' paper, is printed on recycled paper. Vegetable-based inks are used whenever possible.